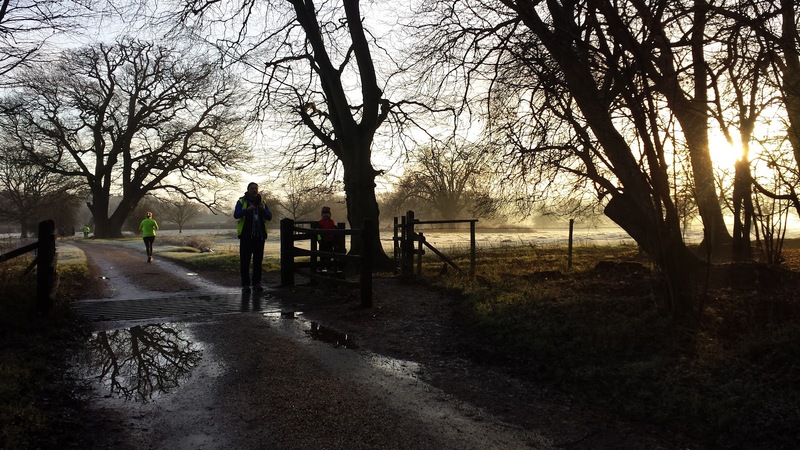 Please note: Since 23 September 2017 Hatfield Forest parkrun is no longer be in operation. 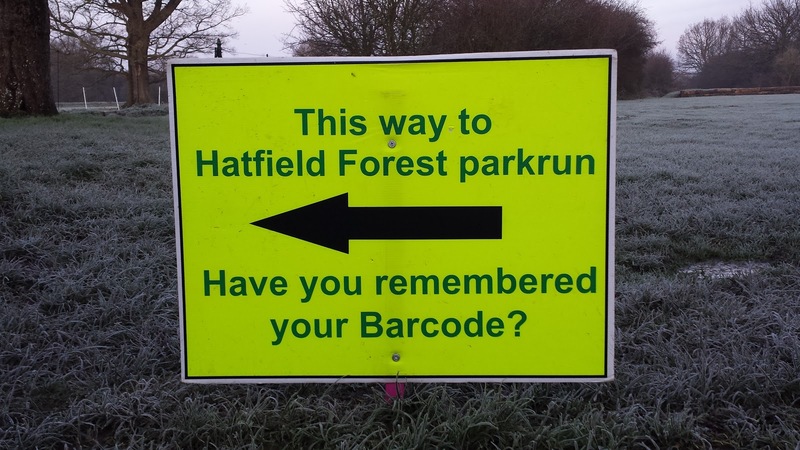 Please see the following announcement - Hatfield Forest parkrun Relocation Statement. This was followed by an additional post to answer any questions - Questions about the relocation. The new venue at Castle Park, Bishop's Stortford is now live and you can read my venue blog here - Castle Park parkrun. 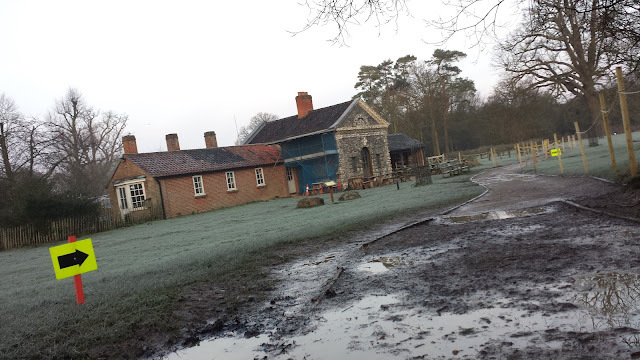 Hatfield Forest, in Essex, is the only remaining intact Royal Hunting Ground in the country. 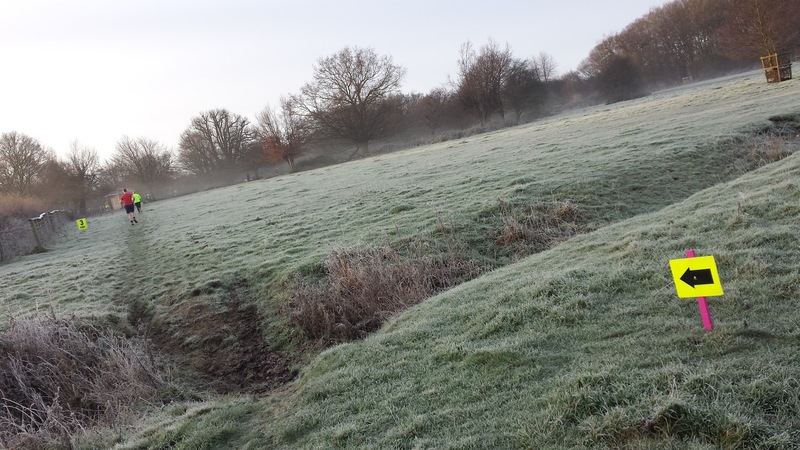 Its name originates from the Anglo-Saxons who, in the year 410AD, named the area Hoep-Feld meaning heath-field or 'heathland in the view of woodland'. 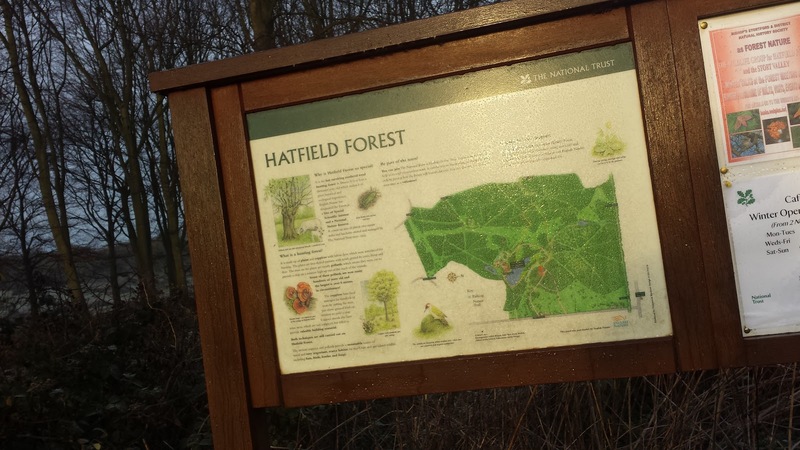 It later became Hatfield Forest, with the 'Forest' part defining an area where deer were kept for hunting rather than the modern day definition of 'a large area covered with trees'. As time moved on, the ownership of the forest changed hands and for a time became an extension of Hallingbury Place (one of Essex's finest country houses until its demolition in 1926) when landscaping improvements took place resulting in the construction of a lake. Around this time, a Grotto decorated with shells was built adjacent to the lake; this still stands and is known as the Shell House. 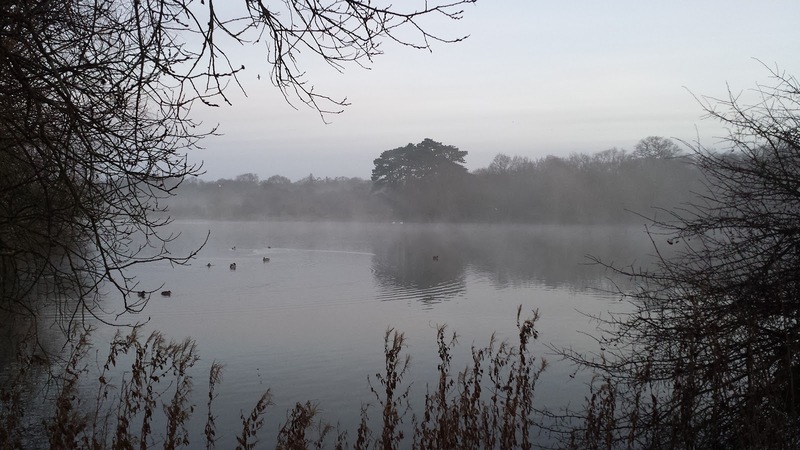 According to a survey conducted in 2008, the forest is home to 58 species of birds including woodpeckers, geese, swan, kestrel, kingfisher and grey heron. There are also 8 species of bat residing here. Then there is the forest itself; there are 400 species of plants and 600 different fungi. 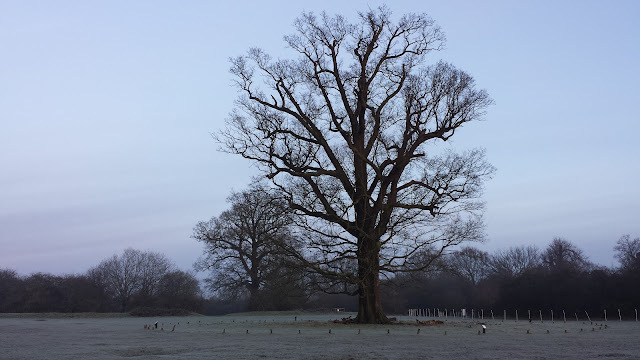 In addition to those, there are over 800 ancient trees here with some being over 1,200 years old. This is a very special place. My visit here came on a pretty special day in the parkrun calendar, New Years Day; the one day in the year where parkrun HQ allow runners to register two official parkruns. 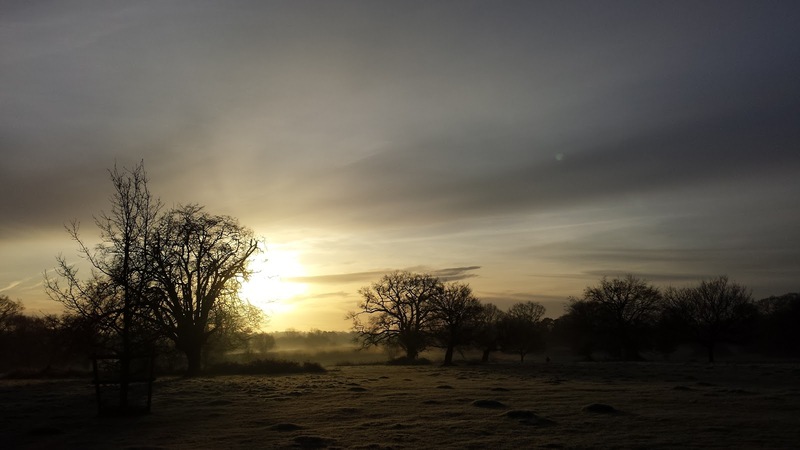 It was also a cold, frosty day and as I arrived at the forest, the sun was rising through a misty landscape and I found that I was mesmerised by how beautiful it is here. 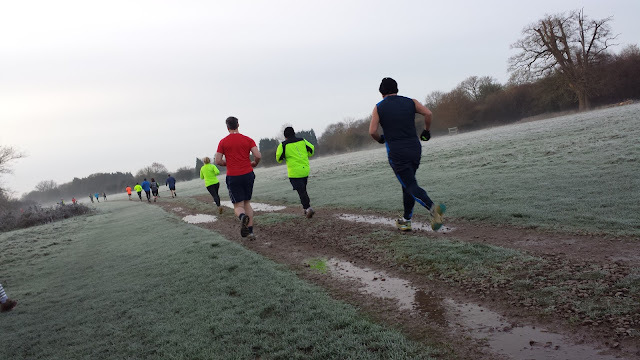 Hatfield Forest parkrun takes place on one of two courses (summer / winter). They are both a single 5km lap through the forest which and run in a clock-wise direction. The terrain is a mixture of hard tarmac-like roads/paths, grass and some dirt/mud trails. Overall the forest sits on fairly flat ground, so it's pretty much flat give or take the odd small change in elevation. There are good road transport links to this venue, the M11 is just to the west and Stanstead Airport lies immediately to the north of the forest (in fact a Korean cargo plane crashed into the forest in 1999 shortly after take-off, killing all four pilots and resulted in part of the forest being closed-off for ten years). Upon arrival you can park in the visitors' car park near the Shell House for free by placing a copy of a parkrun barcode in your window (otherwise it's £5). I will note here that you must arrive early in order to get to the Shell Car Park as part of the run takes place on the road that runs through the forest to the car park and a marshal will close and lock the gate at approximately 20 minutes before the start of the run. Cyclists can reach the venue via the Flitch Way cycle route and use the cycle racks provided adjacent to the car park next to the briefing area. The closest train stations are at Bishops Stortford and Stanstead Airport but please be aware that it is not particularly easy to get to the venue on foot. There are buses that run from the train stations that pass close to the forest, but you will still be left with 2km to cover on foot to reach the start area from the stop (ideal for a warm up, but I'd definitely advise researching your timings carefully before travelling this way). At this venue they are currently have two routes in use; there is the standard summer route, but as I mentioned above, I visited on New Year's Day and that means the winter course was being used. 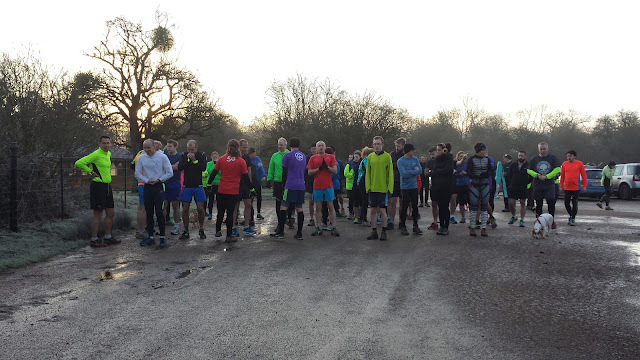 The run briefing takes place adjacent to the Shell House car park and then everyone walks to the start line which is in the car park (the gates at the front will be closed so there will be no incoming vehicles at this point). So the runners start on the tarmac road and throughout the run spend quite a sizeable amount of time on this type of surface. There's also quite a bit of grass to run on, but even though it was winter, it was not waterlogged or particularly uneven so was quite pleasant to run on. I wore my proper trail shoes, but I could have gotten away with my light trail (hybrid?) shoes instead. At this time of year I definitely wouldn't go for road shoes, but I suspect they'd be fine during the summer (I'd still wear trail). As the venue is so close to Stanstead Airport there's always a good chance that you'll hear the rumble of a jet engine in the distance, and I saw a few low flying aircraft while I was here. Being a forest run you'd expect to be mostly running through the woods, but in actual fact we spent very little time within wooded areas. This ties in nicely with the original meaning of the name 'Hoep-Feld' as explained at the top of this post. 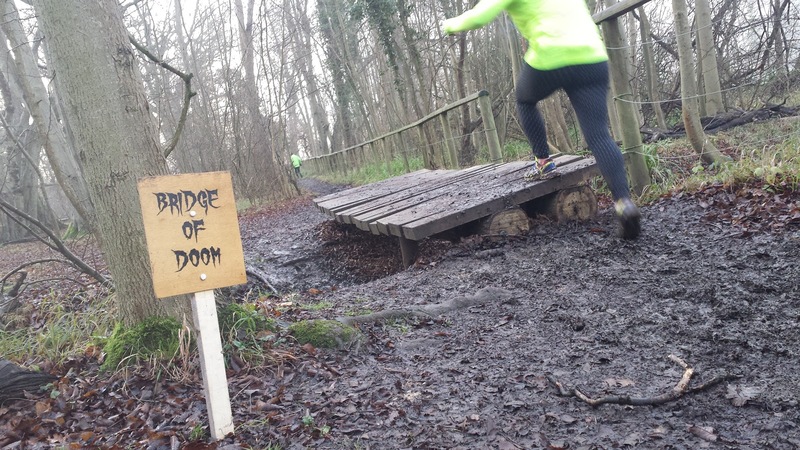 There's the odd muddy ditch to run through as the lap progresses, but apart from that it's all pretty clean, but splashy, cut until you reach the final 900 metres or so. From memory that last 1/2 mile features a section on grass with some twists and turns followed by the longest single stretch of forest path where runners cross a raised path and then negotiate the 'Bridge of Doom' - there is the option of using the ditch instead so the bridge step can be avoided. This leads onto a path the runs adjacent to the lake (splashy fun) and the finish line is found just around the corner in front of the Shell House. 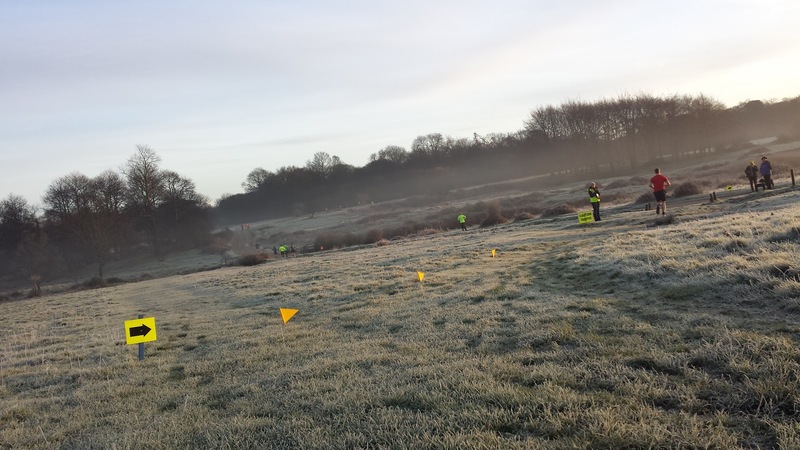 When I visited, the barcode scanning took place on the path immediately after the the finish (don't worry, there is plenty of space to recover) and there is a cafe serving all sports of lovely refreshments straight after this. Toilets are also located within this area. 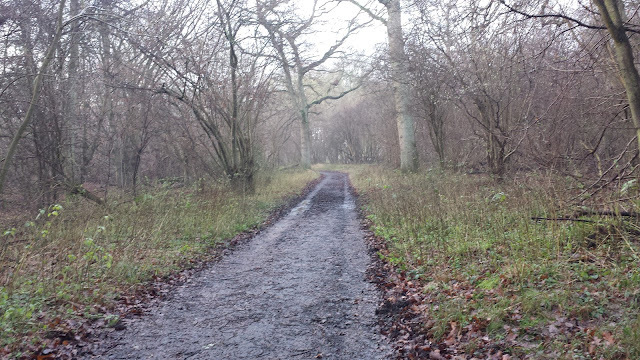 As far as buggy running goes, I would be happy enough around here, but it may may not suit everyone. 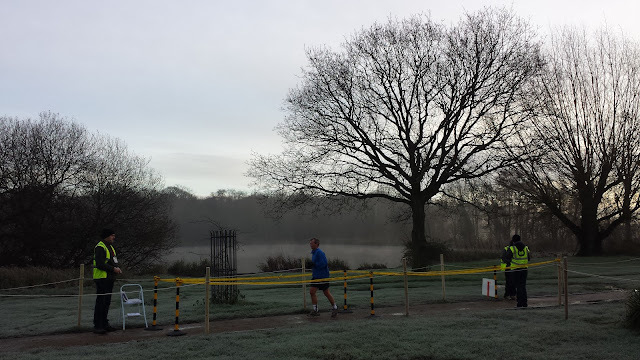 I ran here at event 41 where 63 runners took part in the run. 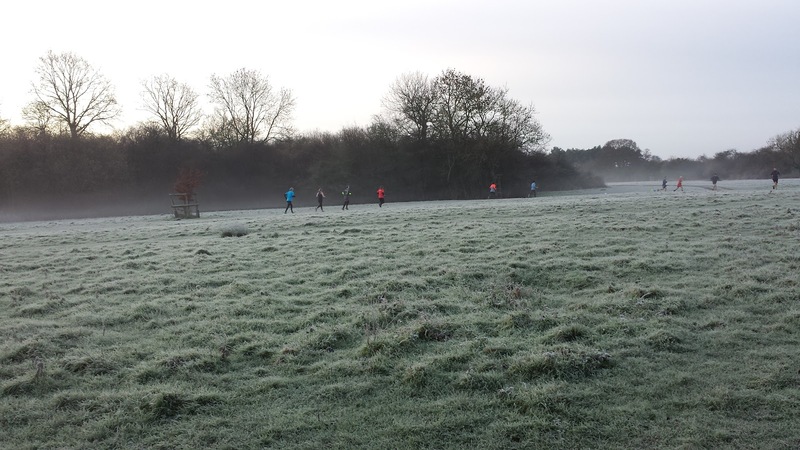 The current average number of runners is 144.7, but there were a lot less because of a couple of reasons. Firstly it was New Year's Day (Friday) and secondly the start time was a little earlier than usual and we kicked off at 8.30am to allow people the extra time required to visit a second venue. I tracked my run with Strava on my phone, but the mobile signal here was quite weak and it wouldn't upload until I had driven a few miles down the road where the signal improved. If you would like to see the course in more detail please feel free to have a look at my data from Strava [Hatfield Forest parkrun (winter route)]. Being New Year's Day, I was eager to get back on the road to visit my next venue, which meant there wasn't a huge amount of time to hang around and chat. 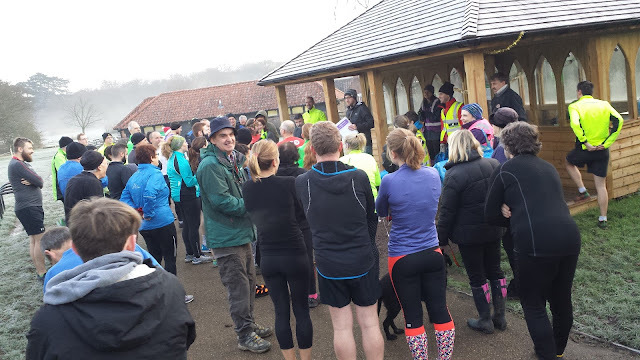 So sadly, I jumped straight back into the car and headed off to my next venue for the day, which happened to be Barclay parkrun [my Barclay parkrun blog post]. I think I was the only person to run this combination of venues on the day. As I drove along the access road, I was very pleased that I had visited this venue and I somehow managed to come on the perfect day because the mist hanging over the grounds really added to the medieval atmosphere. As I mentioned earlier on - this is a very special place.